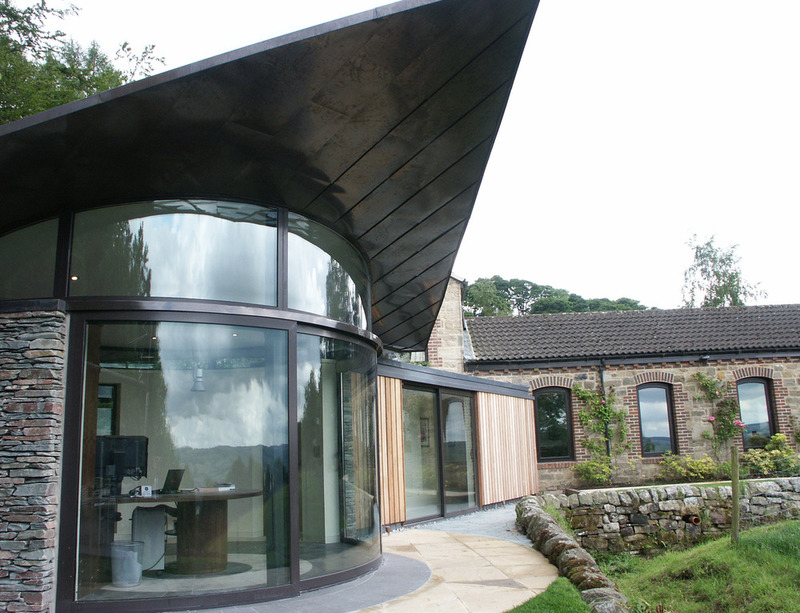 Balcony Systems created a complex combination of curves in three axes to fulfil the architect’s demanding design for a photography enthusiast’s home office and studio in rural Yorkshire. 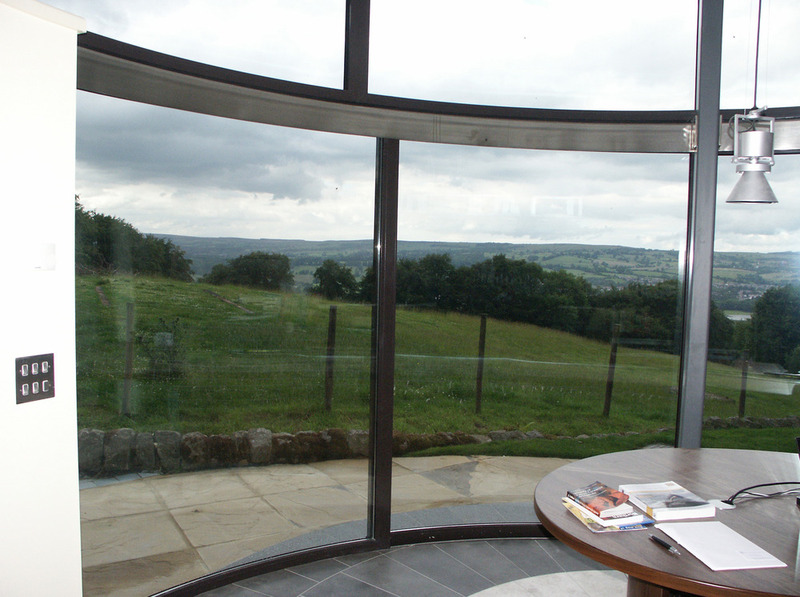 Installed by Balcony’s sister company VBS, the curved fixed windows and three-pane sliding curved patio doors complement the curves of the circular building, built by contractors William Anelay Ltd of York. Featuring one fixed and two sliding panels, the doors when fully open provide a three metre-wide direct access to the garden. 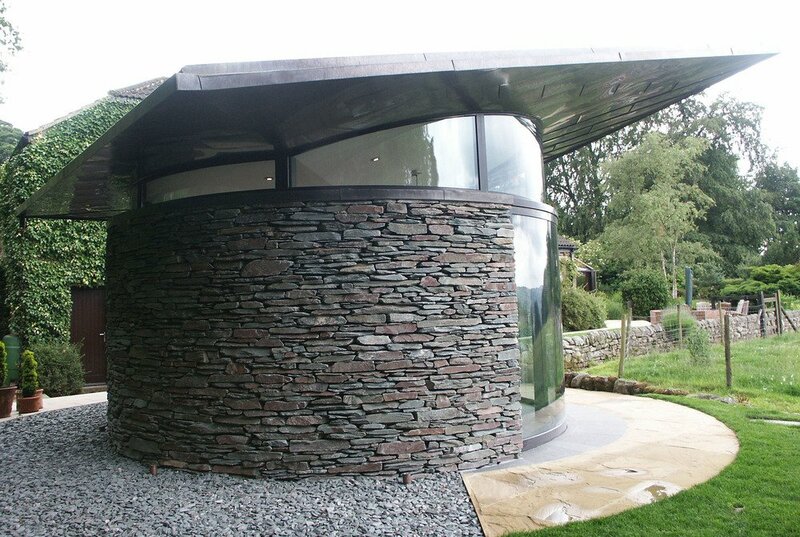 Their brown powder-coated frames replicate a bronze anodised finish to match the diamond-shaped pre-oxidised copper roof, supported by Borrowdale slate walls. 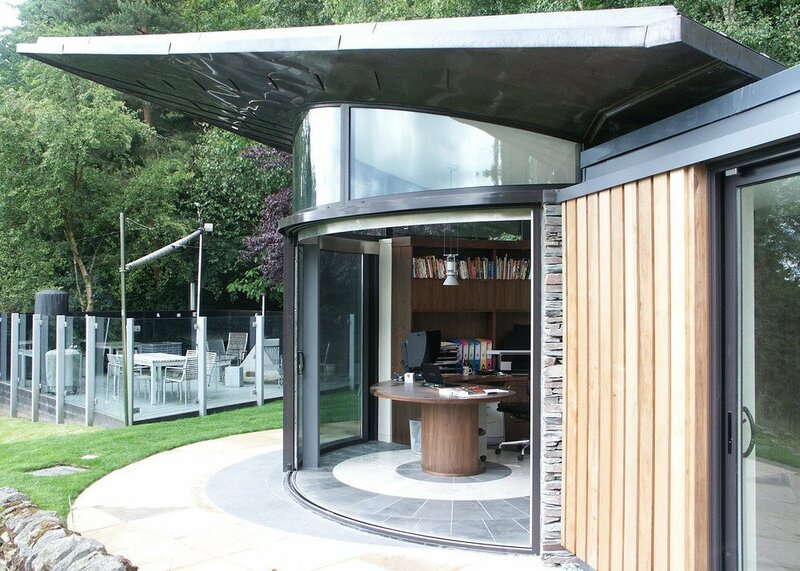 Wildblood MacDonald Architects specified the unique design, with its sloping angular roof intersecting a curved face, for their client who wanted space and light to pursue his hobby. The stunning result is a ‘picture-perfect’ solution combining light-enhancing aesthetics with practical access and taking advantage of expansive countryside views. Balcony Systems’ Managing Director Effi Wolff personally took on the challenge of designing and producing such ‘non-standard’ and highly-unusual shapes, saying: “From a technical perspective, we were initially unsure whether we could achieve this as curving the aluminium frames required a combination of curves in three different axes. Effi added: “We always enjoy a challenge and when architects or designers plan an unconventional shape like this, which has the complexity of combining curved on plan windows with a sloping roof, we feel a great sense of achievement when we are able to fulfil the design envisaged and not revert to the safety of what has always been done. Architects are the ones that push design to its limits and I like to think that we are one of the companies that can realise the architects’ visions. Project architects Philip Wright and James Maclean chose Balcony Systems for the company’s unique ability to meet the project’s demanding specification. “Balcony was literally the only company that could supply the curved elements, which are used to great effect on this bespoke building. Everyone is very satisfied with the result,” commented James. “Balcony Systems gave us good service, with flexibility and ease of communication throughout the project. It’s the first time we have used the company and it’s quite likely we will again,” he added.